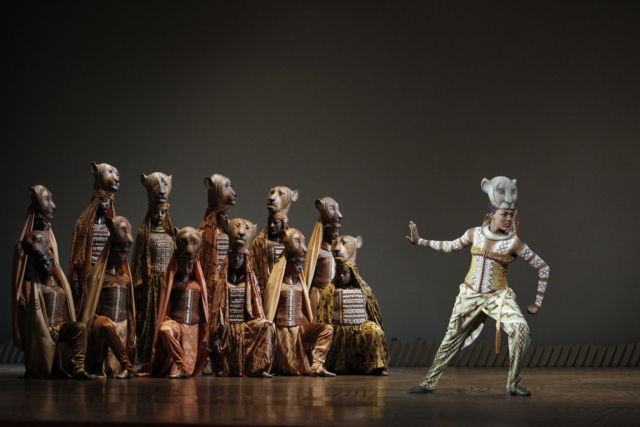 In its 19th year, The Lion King remains one of the most popular stage musicals of all time. Since its Broadway premiere, 21 global productions have been seen by more than 85 million people around the world. The show’s return to Minneapolis marks the fifth time The Lion King has played the historic Orpheum Theatre following its sold-out, pre-Broadway world-premiere in Minneapolis in 1997. Hennepin Theatre Trust will also be offering a sensory-friendly performance of The Lion King on Saturday, July 30 – the first ever of its kind for a Broadway tour in Minnesota. This special performance provides individuals with sensory, social and learning disabilities, and their families, with the opportunity to enjoy live theatre in a welcoming and supportive environment. Slight adjustments to the performance will be implemented, including a reduction in jarring sounds and strobe lights focused into the audience will be eliminated. In addition, the Orpheum Theatre lobby will offer quiet spaces and activity areas for families, there will be standing and movement accessibility throughout the theater, and sensory objects including fidgets, earplugs, and noise canceling ear-muffs will be provided. Trained staff and volunteers will be available to offer encouragement and assistance to patrons. The beloved Disney film-turned-Broadway has delighted audiences the world over and it shows no signs of slowing down. Tony Award-winning director Julie Taymor brings to life a story filled with hope and adventure set against an amazing backdrop of stunning visuals. The majestic choreography, ground-breaking puppetry, and engrossing music and vocals keep audiences coming back for more. Drew Hirshfield takes the stage as Zazu, the majordomo to the King of Pride Rock. Everyone knows the film and the musical does such a great job of keeping the spirit of the Disney animation alive while bringing it to another level. How do explain the magic of the show to someone who has never seen it live? Drew Hirshfield: I would say that, while it honors the story that we know from the animated film, it’s a theatrical reimagining of it. So it’s the theatrical metaphor that can only exist in the theater, and does so quite beautifully. And I think it’s one of the reasons why it’s been around for so long because it really is a piece of theater that can only be experienced in the theater. It’s the puppetry and the masks and the African music that’s infused into the theatrical telling of the story, it’s really remarkable and totally awesome. With a show like The Lion King, the characters and their voices and mannerisms are so iconic. What is it like to step into such a beloved story and take on the role of a recognizable title character like Zazu? DH: Oh, it’s great because there is the legacy element that everyone knows who this guy is. But your job as a theatrical performer is not to worry about that and just go out there and play the show like you haven’t played the scene before. Even though, of course, everyone knows what’s going to happen and I’ve played the scene a lot of times before, but the idea is, you know, that Zazu has never played this scene before. And that’s where I keep my attention. 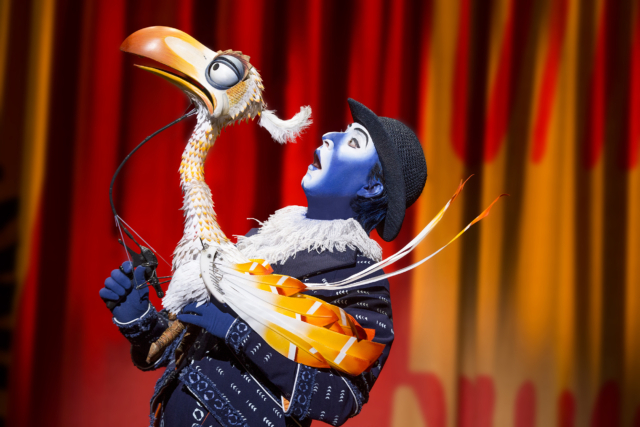 But the actor, Geoff Hoyle, who first played Zazu when they first developed the theatrical show… Kind of a cool connection, I grew up in the San Francisco Bay area and went to college and drama school there, and I knew the Bay area actor Geoff Hoyle. And this was before Lion King, but I used to see him do stuff in the Bay area. So it’s cool that I used to watch him as an audience member as a young theater person, and now I’m stepping into the role that he first created. The Lion King presents the additional challenge for actors to also work as puppeteers. What challenges or joys do you get out of also having to work with a puppet? DH: I’m an actor first and a puppeteer now, but only since coming to The Lion King. It’s awesome! The puppets are so well-made and so evocative. It’s really, once you get the coordination down — which takes a good, long while, don’t get me wrong there — but once you get the coordination down and you’re connected with your puppet, it’s really just an extension of the experience for the character on the stage. It’s great. It’s a great challenge, it’s a great joy. It’s like instead of my arms being three feet long, I have this puppet on the end of them so my bounds of expression are even longer. And the actors aren’t dressed in all black or disguised in any way. What does the duality of the actor and the puppet add to the experience? DH: I think what [director, costumer designer, and mask co-designer] Julie Taymor calls it, and this is a theatrical trope that’s been around for a long time, is the idea of having the “double event.” So the audience gets to experience the actor involved in the situation that’s happening on stage and the puppet. And I think both resonate off each other in a cool way. That’s where a lot of the theatrical metaphor of the piece lives, I think, in the fact that you can see it’s a dude, but it’s also a bird. Or it’s a lady, but it’s also a lioness, and they’re both having the same experience. The Lion King will also be doing a sensory-friendly performance. How great is that experience for you as an actor to open up live theater to all audiences? DH: Oh, it’s great. I think I’ve done one or two and the company has done a handful over the years. It’s touching, because I think a lot of these special needs kids are not drawn to the theater for obvious reasons. And yet, I feel like story telling and understanding life through stories seems so essential to many of them. This is just my experience from being on stage and being on the periphery of all of this, but it seems very meaningful to them. It’s not just your average Friday night at the theater; that is an average night for some people. This feels special. It feels important. So it’s great that we have these organizations that put these together and that our local producers and the New York producers are able to make these happen. I’m looking forward to it; it’s very cool. The Lion King runs at the Orpheum Theatre through July 5–August 7. For more information and to purchase tickets, head to www.hennepintheatretrust.org.